The Image of the sagacious magician looking knowingly at the viewer with small imps whispering the enduring secrets of magic in his ear has been often used on magician's advertising posters. This image of the magician getting the "secrets" from these underworld demi-devils apparently started with Harry Kellar (on his 1894 poster). Leon Hermann (nephew of Alexander) who overlapped the career of Kellar seems to be the first who copied the whispering imps. Not only did the Great Hermann include them, he used more imps! Several of the imitators have been satisfied with a single informant but the standard seems to be two - one per shoulder. Keen's informant is a great deal older - and may be Mr. Scratch himself. 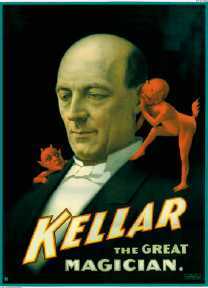 The poster that is probably the most famous and the one most often directly copied is the splendid Kellar poster. Thurston seemed to like the idea so much he used it three times, Raymond had two slight variations. It was used once on a book cover. Although many have directly copied Kellar's imps (myself included), the wee devils show up with tails, wings, pointed ears and in the company of other underworld creatures. Banachek has updated the imps as space aliens.